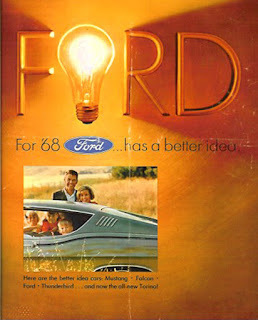 Once upon a time, back when companies spent money on real marketing, Ford launched its Ford has a Better Idea campaign. This was back in the days when the media was highly centralized and Ford got a lot of mileage out of this campaign. You saw it in print, watched it on TV and heard it on the radio. It was a big deal. It was never exactly clear to me if Ford actually had a better idea. I'm quite sure there were arguments on both sides of that question. Nonetheless, in the world of business, which includes beer, some ideas are clearly better. No, I'm not talking about light beer. Sometimes you run across great ideas in unexpected places...in this case at the Whole Foods Market in (Bridgeport Village) Tigard. I stopped there last week as part of the wacky contract work I do. No, that work doesn't involve beer. 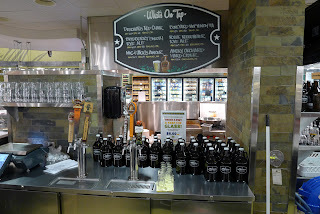 Inside the store, I discovered something I'd been hoping to find in a grocery store for quite a while: beer taps and growlers. 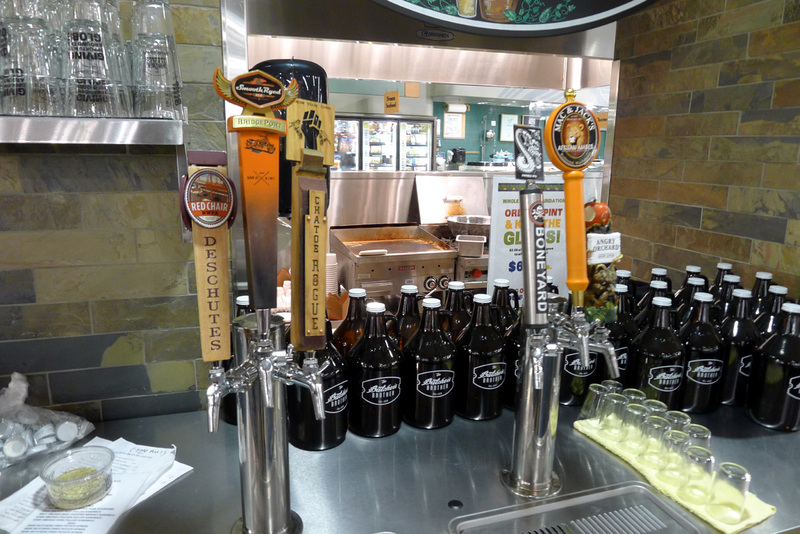 The taps are located toward the back center of the store in what is essentially a makeshift pub called Butcher's Brothers. They serve barbecue goodies and related foods, and there are six taps pouring five beers and a cider. While I was stalking the joint, I observed several sets of people enjoying food and beer. Who says a pub in a store can't work? About the tap list. They were pouring Boneyard Hop Venom, Deschutes Red Chair, Bridgeport Smooth Rye Ale, Mac & Jacks Amber and Rogue Roguenbier Rye Ale. The cider tap was occupied by Angry Orchard of Ohio. They tell me two of the beer taps, as well as the cider tap, will rotate. They were running a $10 special on growler fills (with free glass) to help get the word out. Fills will cost more than that going forward, but prices will be competitive. Honestly the Whole Foods gig was a chance to show that they needed a friendly foodie like me to help bring their beer set to life. It's a chance to show them what a business savvy enthusiast could do with it. I think the most shocking thing I ever heard from one of my team leaders was that they couldn't believe beer could have so much success. I was like, "Excuse me. You do know you're in Portland, right?" I have passion for it and I give it 110 percent. I love the culture, the people and, of course, the beer. Each one makes me strive harder to learn more and meet the people who have made it successful. As an east coast enthusiast who dreamed of enjoying a west coast life of beer, I have to say I'm one step closer. Let me take a step back for just as second. 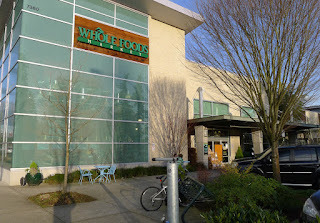 This particular Whole Foods is gigantic compared to the smaller ones we have in the city. I don't want to guess the square footage. The manager on duty told me the Tigard store does a huge volume. Sure enough, it was packed with suburbanites on a late Sunday afternoon. I suspect this is the perfect place to try the beer and growlers experiment. Folks out in suburbia don't enjoy the same beer culture we do in the city. I'm not saying Tigard is all that much of a hoof, but there are four breweries and numerous pubs within walking distance of my house. My options are almost unlimited. It's different out in the burbs. Dan told me he spends a fair amount of time talking to customers. Some might call that education and I think that's a mistake. What he's really doing is sharing his thoughts, ideas and knowledge with people who want to know more about craft beer. Talk about a perfect fit. I'm probably not your normal customer (I have a lot of stubborn opinions), but we talked for nearly an hour. This is evidently the first Whole Foods store in Oregon to play around with on-premise beer sales and growlers. They plan to see how it goes. Of course, having draft beer and food opens up some interesting opportunities. Dan said they expect to offer dinners with beer pairings, and will likely invite brewers to come in and talk about their beers. What a terrific idea! If all goes well, more taps may be added down the road. 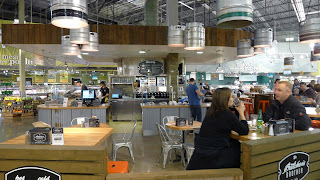 In case you're wondering, draft beer isn't the only thing they've got going at the Tigard Whole Foods. Dan has put together a very impressive beer wall. 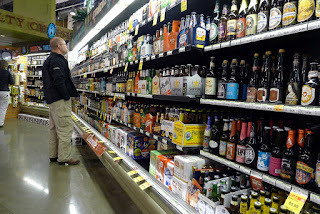 One of the cool things about Whole Foods (regardless of how you view the owner's politics) is the beer specialist/buyer essentially owns the beer section. This runs counter to the way it works at most big box stores, where a suit somewhere tells you what to carry and how to arrange the shelves. Dan told me everything on his shelves is a decision. That doesn't mean he's going to ban a beer he personally doesn't care for. That would be bad business if the beer is something customers want. Coors Light, for example. His strategy has been to gradually build a selection of fine beers as the clientele gets more sophisticated about what they're looking for. The approach to beer at this particular store is quite fresh. I can't say I necessarily expected to find such vision here, but there it is. Everyone involved in putting this plan together deserves a lot of credit. They clearly have a better idea when it comes to beer. 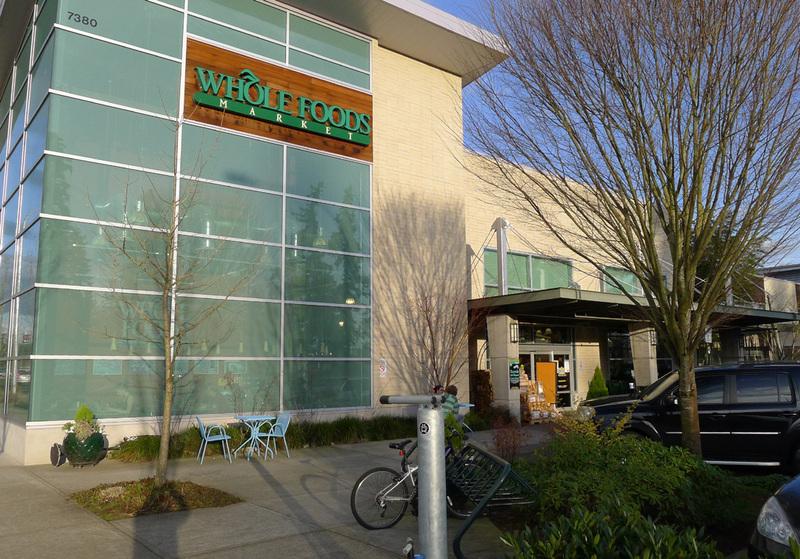 Update: I'm hearing that other stores in this area are doing something like what they're doing at this Whole Foods. This is simply the first instance I've seen. 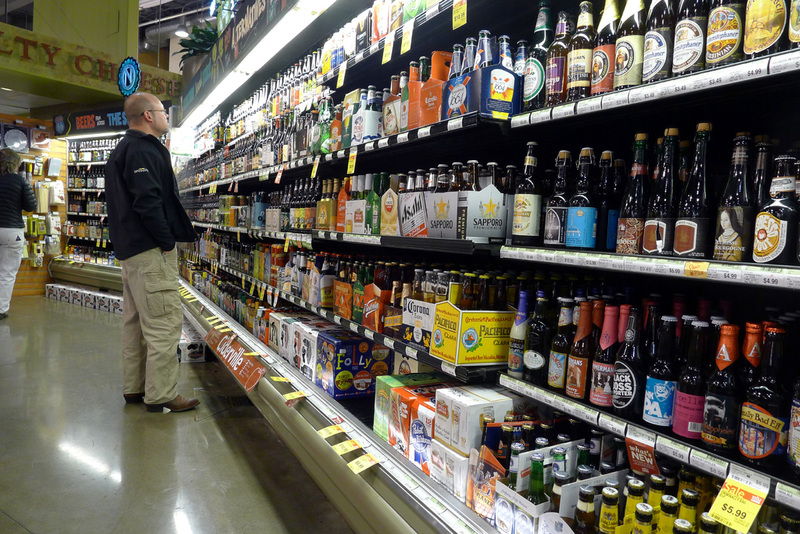 Yep, the new Local Choice grocery at NW 9th and Everett has 4 beer taps and a couple wine kegs. You can drink beer there with food from the deli or bakery, or get a growler. The times I've been past the bar there, there was a Pfriem, a Gigantic, a Boneyard, and something else. Nice space, worth a visit for a snack and a beer. I expect this idea to take off as I've been to Whole Foods in Phoenix (Chandler actually), they have 12-15 taps, 3-4 being nitro, with lots of variety, Delirium Tremens on tap for example, and there are always people drinking beer, talking about beer and grocery shopping. Yes it is a really good beer idea. I suspect a lot of places are going to figure out a way to make this happen. We're seeing the tip of the iceberg right now. If you have never met Dan Phillips, he is one great guy, reserved at first, but a walking billboard for the entire beer industry. I am his friend, granted, but I hope everyone can meet Dan, you would be his friend too. Great article, well deserved!! Congrats, my friend. I did meet Dan...spent nearly an hour talking to him about beer. He's a terrific guy with deep knowledge of craft beer. I'd say Whole Foods is lucky to have him.